Rest? When I was Cabrera's age I didn't need any rest. It's a slow news time, with what looks to be a set roster and spring training slowly approaching while we all eagerly await Fabian's Wayne Franklin writeup. I'll probably start my player previews over the next week or so. A reader sent me a question that might be good topic for discussion so I'm going to throw it out there and invite everyone to provide their opinions if they feel like it. As you know, many sports teams are owned by corporations – AOL owns the Braves, News Corp owns the Dodgers, Cablevision owns the Lakers… Well, if they’re going to go to the trouble of owning them, why not bank on them? Instead of naming the team after the city, name them after the corporation. Or even if they are personally owned, they could sell the name of the team to the corporation. For example, instead of the Boston Red Sox there would be the Tampax Red Sox… What do you think? Tampax Red Sox. Sounds good to me. Yankees manager Joe Torre has told GM Brian Cashman that he'd like to give Bernie Williams a shot at making the team, according to a source close to Williams. However, the Yankees' 40-man roster is full, and there appears little opportunity for Williams to contribute. What are the odds that if Bernie gets a shot at making the team from Joe Torre, he doesn't make it? 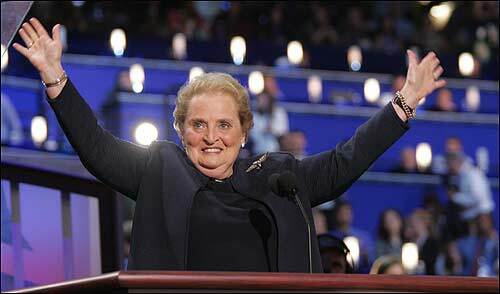 Please Brian Cashman, hold firm. In some non-Yankee news, since a lot of Yankee fans seem to be overly concerned about Boston possibly picking up Todd Helton, I ran some more Diamond Mind simulations, swapping out Todd Helton for Mike Lowell and moving Kevin Youkilis to third base. This ended up being about a fairly decent offensive upgrade, but a five run or so defensive downgrade, and nets them out out as one whole win better in 2007. 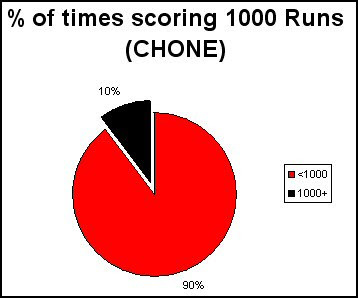 These are over 100 trials with the latest rosters using CHONE. DIV and WC are division titles and wild cards over 100 trials respectively. 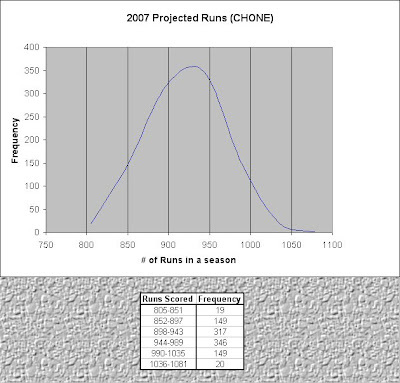 StD W, RF, and RA are the ranges for wins, runs for, and runs against within one standard deviation of the mean. This doesn't mean Helton can't outperform his projections with better health this season, or that Lowell doesn't underperform his which makes the difference more stark, but any Yankee fan panicking about Boston getting Helton is overreacting. Update: Out of curiosity I decided to look at the Helton/Lowell swap numerically. Using their PECOTA offensive projections, here's how Lowell, Helton, and Youkilis project for 2007, in terms of batting runs above average by linear weights (not position adjusted). We have to park-adjust the batting runs accordingly. For Colorado the 3 year weighted average for runs is 1.24, for Fenway it's 1.04. So adjusting these we get these new values. Defensively, here's how they project using a weighted average of their zone ratings plus aging/regression. 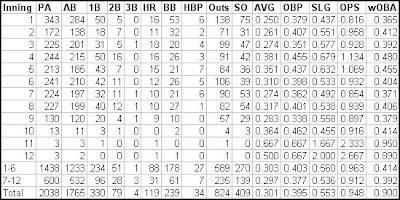 So combination 1 of Lowell at 3B and Youkilis at 1B combines for 29 runs of offense and 3 runs of defense above average, a total of +32. 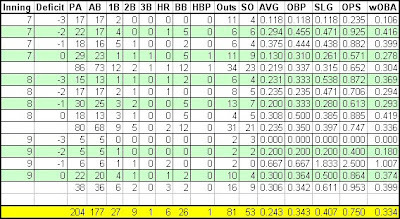 Combination 2 of Youkilis at 3B and Helton at 1B gives 48 runs of offense and 0 runs of defense, or a total of +48. So it's a 16 run net upgrade overall, or a win and a half. Not much different than the simulations. 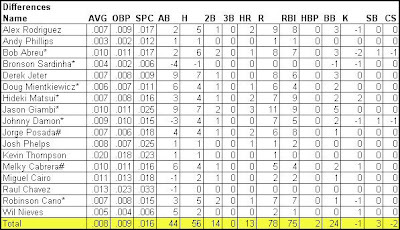 By request, I ran the 2004-2006 clutch numbers that I ran for Alex Rodriguez a few days ago for the motley crew of Derek Jeter, Albert Pujols, Gary Sheffield, Jason Giambi, Hideki Matsui, and some person named Ortiz David or something. I did see the requests for Mauer, Morneau, and Vlad Guerrero and will try and get to them next week. I won't clutter up the blog with all the numbers, so you can go to this Google Spreadsheet link for the gory details. I'm just going to post the wOBA in the various situations I'm looking at here. First up, let's look at the splits for these guys when their team is trailing, tied, or leading, compared to their base wOBA. 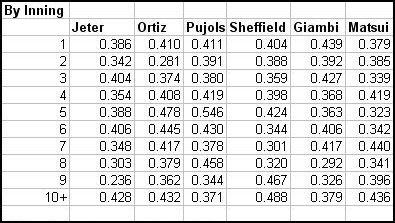 Remember, wOBA scales to OBP. I split out 2006 for Jeter only due to time constraints. Albert Pujols is clutch-defined. 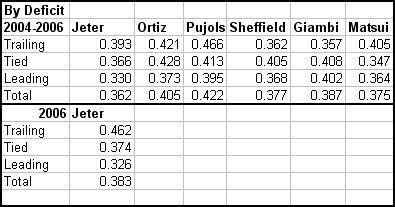 According to the data I'm looking at, Pujols had 629 plate appearances over the last three seasons where his team was trailing and hit .366/.429/.698 for an OPS of 1.127 and a wOBA of .466. It's interesting to see that Jeter and Ortiz both do better when their team is trailing, which lends credence to their clutch reputations. And here's how they do by inning. Lastly, let's look at the situations that I'm defining as the plate appearances where their team needs them the most, tied or trailing by 1-3 runs in the 7th inning or later(including extra innings). Hideki's more clutch than Ortiz! Not really, wOBA doesn't include intentional walks or changes in win expectancy. It assumes average run values of all the offensive events. It's pretty obvious that Ortiz's production has helped his team win more games than they would have been expected to. You can also certainly quibble with the criteria that I've defined as clutch. Anyway, I don't know that any of this is predictive. Research says it's probably not, but the fact is that by the time the players we would be trying to predict accrued enough plate appearances in these situations to show that it can be predicted, it'd be too late to make much use of it. This all gets back to the clutch hitter, and whether or not he exists. He may, or he may not, but clutch situations definitely exist. You can look at the great work done by Tango Tiger on Leverage to see that. There is no spot on the Yankees’ roster for Bernie Williams, who is uncomfortable as a free agent after 16 seasons in New York. Williams does not want to retire, yet he does not want to leave the Yankees. Jorge Posada, who received an award at the Baseball Assistance Team dinner in Manhattan last night, said he has kept in close touch with Williams this winter. Apparently, retirement is not an option. Posada said Williams, 38, has told him that other teams have called. But with the start of spring training less than three weeks away, Williams has resisted. I feel a little for Bernie here. It can't be easy to be facing the end of your career. If I were him, I'd want to keep playing forever. It's possible that he could be an asset in an extremely limited role that keeps him off the field, but with the current personnel on the team it'd be a waste of a roster spot, and with Joe Torre around, it's unlikely his role would be limited enough to not hurt the team somewhat. It's also a potential harm to Melky Cabrera's development. If Bernie is really done as a Yankee, it closes another small part of what's been a great time to be a Yankee fan. Try not to just think of the guy whose knee injury in 2003 brought a great career to a swifter than expected decline. Also think of the guy who put up OPS+s of 130,148,159, 157, and 136 from ages 27-31 while helping the Yankees win four World Series in five seasons. I'll get to the rest of the clutchness stuff over the next few days. I'll run the numbers for 2004-2006 for David Ortiz, Albert Pujols, Gary Sheffield, Jason Giambi, Hideki Matsui, and Derek Jeter. If you have anyone else in mind, post it in the comments. For as long as Alex Rodriguez has been and will be a Yankee, the question about his "clutchness" or lack thereof has been coming up and will likely keep coming up. 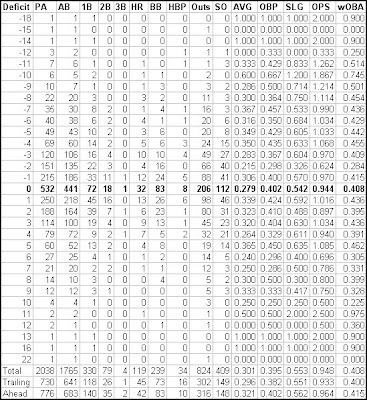 Thanks to the great book Baseball Hacks, and the wonderful organization Retrosheet.org, I've been able to create a play by play database on my computer that can let me look at data that was previously almost impossible to look at in any reasonable time frame. 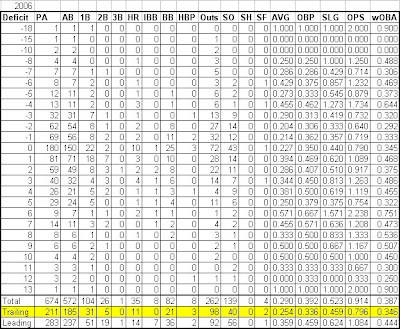 Today I'm going to use that data to try and break down Alex Rodriguez's performance as a Yankee in certain situations. As a caveat, we're dealing with very small sample sizes in many of these situations, so keep that in mind. So Rodriguez has batted 730 times with the Yankees trailing, and he's hit .301/.395/.553 for a wOBA of .408. He's batted 776 times with the Yankees ahead and has hit .321/.402/.562 with a wOBA of .415. That's a slight difference, but hardly the chasm the media and many fans would have you believe exists. But what about the myth that Rodriguez does all his damage early in the game, when it supposedly doesn't count? Here's a graphical representation of that chart, plotting Rodriguez's wOBA by inning. There's a bit more of a split here, as he's hit .303/.403/.560 for a wOBA of .414 in innings 1-6, and .297/.377/.536 for a wOBA of .392, but again not nearly the split that you'd think given his coverage in the press. You can use wOBA to estimate a run value by multiplying it by the plate appearances and dividing it by 1.15. To figure out the difference in the performance we can subtract one wOBA from the other and do the same thing. So (.414-.392)/1.15 x 600 PA gives you a difference of about 11 runs over a full season. 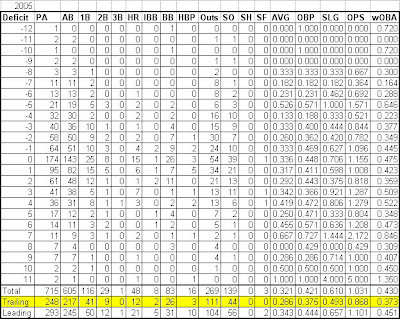 This table just looks at the sum of his production by both inning and deficit. The sample sizes here are again way too small, so this is really just for information. Let's take just the plate appearances where the Yankees are trailing by 3 runs or fewer or are tied, from the seventh inning on. Now we can see a pretty severe falloff, although we're dealing with just 204 plate appearances. In summary, these numbers tell me that Rodriguez's reputation of failing in the clutch is a little unfair. The last table is certainly valid evidence that he has not been as good in the specific situations where the Yankees needed him most, but the other stuff about how he does all his damage in blowouts and early in games is pretty overblown. I've uploaded this data to a Google Spreadsheet for anyone who wants it. These don't include playoff games, which I hope to eventually incorporate into my play-by-play database. Next time, I'm going to look at the same splits for Derek Jeter, whose clutch reputation is the polar opposite of Rodriguez's. spreadsheet has also been updated for the visually challenged. Another Update Over at Was Watching a reader noticed my numbers were off for the season data. I re-checked and he was right, so here are the revised numbers for 2004, 2005, and 2006. In the 14 months since he wrestled power away from George Steinbrenner's cabal of advisors in Florida, Cashman has reformatted the Yankees into an organization determined to develop star players rather than pay a premium for them. Along with significant roster changes, Cashman has made a series of personnel moves within the baseball operations department, firing several longtime scouts and coaches and reassigning others. I think a lot of us are glad that Cashman's not the Boss's puppet anymore. It's hard to evaluate Cashman as a GM, because it's tough to know which deals are his and which ones are Tampa's. I think he tends to get a pass on some bad moves that are his doing (like Pavano, the Mike Lowell trade, etc.) because of that. I do like the direction he's taking the team in over the last two season though, and think it bodes well for the future. Physical Ability: Joba Chamberlain is yet another big bodied Yankee hurler. Standing 6’3’’ and listed at 225, Joba has actually been considered too big at times. As you would hope with a guy his size, Joba also possesses a terrific fastball. Joba The Hutt typically pitches in the mid 90s with his fastball and can even get it up to the high 90s at times. In addition to throwing his fastball very hard, Joba has uncanny control and command of the pitch. His repertoire is rounded out with a slider, a curveball, and a changeup. At the moment, none of these pitches is anything to write home about. Fortunately, they aren’t terrible either. The slider has shown the most promise thus far. It will be interesting to see whether the Yankees let him be with that as his breaking ball of choice or try and push him towards the curveball as is the organizational preference. As I’ve alluded to, Chamberlain has struggled with his weight at times. Some feel that his struggles with a knee injury during college can be attributed to carrying too much weight. It remains to be seen how much of a problem that, as well as his triceps tendonitis of the past year, will be in the pros. What Happened in '06: Like just about every other Yankee draft pick in 2006, Chamberlain was an early favorite to go in the first round. In fact, he was projected in the top 10. However, due to the aforementioned injury concerns, which led to poor performance, Joba fell on draft day. Unlike a guy such as Ian Kennedy, Joba did not have much, if any, track record to fall back on as he had only emerged as a legitimate prospect the year prior. Fortunately for Joba he has greater physical talent than Kennedy and once he was signed and allowed to play, he made teams begin to regret their decision to pass on him. Chamberlain’s pro debut was in the resurrected Hawaiian Baseball League where he was probably the league’s best pitcher. While his control wasn’t as good as the 46:3 K:BB ratio would indicate, it was still impressive. More impressive was his command, especially on the occasions where he would fall behind batters only to perfect place a pitch and get opposing hitters to turn hitter’s counts into outs. What Lies Ahead: Chamberlain will most likely begin 2007 in Tampa. I don’t expect him to be long for Tampa. 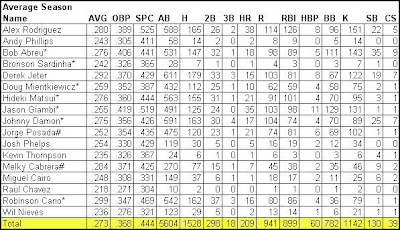 In fact, I hope/think his 2007 will look a lot like Phil Hughes’ 2006. Despite that, I think he’s further away at this point than Phil Hughes was a year ago. In terms of top pitching prospects, Joba is more Mike Pelfrey than Phil Hughes. In other words, he’s going to be able to get at least decent minor league results because he has an overpowering fastball. What will determine how quickly he can be ready is getting one of his secondary offerings, most likely the slider, to the point where he can give batters a different look. Developing those secondary pitches will help him have the means to get outs against quality left-handed batters. Physical Ability: Though he has now increased his weight to about 200 pounds, by most accounts, the 6’4’’ Clippard still has a somewhat slight build. Some look at that as evidence that he may have even more filling out to do, which will lead to a further increase in his velocity. This is such a critical point because Clippard’s velocity is universally cited as the red flag of his prospect profile. As it stands, a typical Clippard fastball registers 90 on the radar gun. When he’s locked in and reaches back for something extra, he can get that up to 94. When it comes to fastball velocity, there are days when Clippard is 86-90, then there are days where he is 89-92, and finally there are the days when he just repeatedly hits 90. It all has to do with how well he’s finishing his pitches and how in-sync his motion is. In addition, to the 4-seam fastball, Clippard’s other primary pitches are the curveball and change-up. He throws a slider from time to time, but it’s not a huge part of his repertoire. Clippard’s curveball regularly comes in at 75 on the gun and has the 12-to-6 break that everyone loves to watch. In the past, he has struggled with leaving this pitch up, but did a better job of commanding it in the second half of 2006. Clippard’s change-up has never been as good as it was from June onward this past year, garnering consistent 80 MPH strikeouts. What Happened in ’06: Clippard began the year pitching for the Trenton Thunder, and pitching terribly. In the early going, it was simply a matter of opponents being able to count on a bloop and a blast. However, as the losses piled up, it became more than that. On June 9th, Tyler Clippard hit rock bottom. His control was poor, rainy conditions did not help, and his ERA ballooned to 5.29 following a 1 inning outing. The results accumulated by the Tyler Clippard who pitched prior to and during that game were never as dominant as the results accumulated by the Tyler Clippard who pitched following June 9th. While Clippard has had hot months in the past, he has never pitched so well for so long as he did to close out last year’s regular season. His fastball was the same, his curveball was the same, but his change-up took a giant leap forward. Having the change-up as a reliable weapon made life much easier for Clippard. Instead of relying on his curveball when he needed a big pitch. He could now go to his change-up without worry, which allowed the fastball to become more of a weapon in those situations as well. What Lies Ahead: Having successfully made the AA transition, Clippard now has to prove that last year wasn’t a fluke and repeat his success at AAA. That’s the reality of being right-handed and not having a “wow” fastball. In a rotation that will be looked at as Phil Hughes, The Injury Replacements, and some other guy, Clippard may be able to force himself to the forefront. The Yankees do not want Phil Hughes to pitch more than around 180 innings in 2007. As such the likely candidate for first call-up will be one of The Injury Replacements. If Clippard is measurably outperforming them and/or they struggle when given their shot, Clippard may be able get a roster spot and a chance in the big leagues. It’s a narrow window of opportunity, but it’s there. Physical Ability: Jeff Marquez is a 6’2’’ right-hander who weighs in around 190 pounds. Marquez doesn’t have the natural downward plane of some of the taller guys in the system, but nonetheless generates tremendous sink on his 2-seam fastball. It is a pitch that typically registers in the low 90s and is complimented by a 4-seam fastball that Marquez can touch the mid 90s with. In addition to the sinking fastball, the other pitch Marquez is well known for is his change-up, which has been a plus pitch for him to this point in his career. Jeff’s primary arsenal is completed with the curveball, which is probably the pitch Jeff is working on the most at this point. Despite still needing some work, it has been a plus pitch for him on occasion. What Happened in ’06: In 2006, things just didn’t break right for Marquez. Jeff came into the season hoping to pitch well in Tampa and get promoted to Trenton. I thought that was a reasonable enough expectation given his talent and the composition of the minor league squads at the time. Unfortunately, that did not happen. As tends to happen with groundball pitchers from time to time, Marquez was beset with bad luck in April. His BABIP was way beyond where it should have been and resultantly, so was his ERA. Then once the numbers began to make sense, Marquez was placed on the disabled list with a muscle strain. This would keep him out for the better part of 2 months. Upon returning to Tampa, Marquez continued to pitch well, but at that point it was too little too late and he would have to settle for only having a solid year at Tampa. Sent to the HBL to complete the calendar year, it seemed that Marquez would dominate, unfortunately he struggled with his command and the results were poor. What Lies Ahead: The key for Jeff’s development will be how well he commands his fastball within the strike zone. At the moment, he’s got pretty good control, he can get the ball in the strike zone on a regular basis, but he needs to throw more quality strikes. Once he does that, the natural movement on his pitches, particularly his fastball, will further increase his already excellent groundball rate. The other development to watch with Marquez will be how quickly he picks up the curveball. It has shown flashes, but is still not dependable. If he can get the hang of it, Marquez could potentially be the proud owner of 4 plus pitches. Additionally, while he has not shown any pronounced platoon splits to this point, such a development would allow him to more easily dispatch left-handed batters. Given the logjam of pitching, especially at the upper levels, the Yankees will be able to be patient with Marquez. Physical Ability: I guess with Christian Garcia’s injury, Betances takes the title of Yankee Minor League Pitcher With Unlimited Physical Potential, or YMLPWUPP. Betances is rail thin at 6’7’’ and 185 pounds. His tall frame allows him to throw on a downward plane, but he still gets the ball up in the zone from time to time. In addition, his build worried some scouts that he would have serious issues repeating his delivery, however to this point in his pro career he has done well at keeping himself under control. Betances’ fastball is a four seamer that comes in around 93-95 and has touched all the way up to 98. In addition, Betances has thus far proven to be a fast learner, as his change-up and curveball have been much better than expected given his amateur background. What Happened in ’06: Months ahead of the 2006 draft, Betances was looking like a sure-fire first-rounder, but fell precipitously as the draft neared. The primary reason was his stuff supposedly taking a step back as he was reportedly throwing only high 80s on occasion and looked as though he may be far greater a project than your typical HS pitcher. This decline was coupled with an increase in bonus demands and so the Yankees were able to snap him up in the 8th round and pay his asking price. During the 2006 GCL season, he looked very much like the guy who deserved to go in the first round. GCL batters were simply overpowered by Betances, struggling to make solid contact with anything he threw at them. While I was concerned Betances would be a high walk guy, he did not demonstrate such a problem in ’06, hopefully that will continue. What Lies Ahead: Betances will begin 2007 as the star of the Charleston squad. Regardless of how well he does, I doubt he ever gets promoted due to the amount of pitching in the organization as well as the Yankees preference to take it slowly with first year HS pitchers. 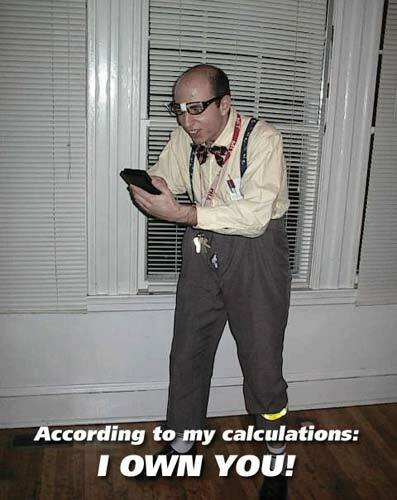 The most important thing to watch for with him should be walk totals. Given the worries about his lack of polish prior to the draft, I’m leery of taking his post-signing performance as who he suddenly is. Rather, I would expect him to struggle with his control from time to time, but still show flashes of dominance. Basically, I think when it’s all said and done his first full year in the system will be more Christan Garcia than it will be Phil Hughes. Can the Yanks March to 1000 Runs in 2007? One of the things we tried tracking last season was the 2006 Yankees and their March to 1000 runs™. Unfortunately for the Yanks, injuries ended the march before it had a chance to really get going. Through Game 29, the Yankees were on pace to score 1022. Then came a DL stint for Gary Sheffield, and Hideki Matsui breaking his wrist on May 11. The Yankees fell to a 992 run pace the day of Matsui's injury, and from there they never really approached a legitimate shot at it, finishing at a very respectable 930 runs scored. Sean Smith e-mailed me last week to let me know that he'd just posted his final version of his Chone projections. So I updated my Diamond Mind program and kicked off a new set of simulations. I ran these 1000 times. It's still to soon for the standings results to mean much, so I won't post them here. This was primarily to look at the Yankee offense specifically. So assuming the CHONE projections are a reasonable baseline for the Yankees' expected performance, they have a 1 in 10 chance at it. Unsurprisingly, it's a bell-shaped curve. The Yankees' standard deviation for runs scored was 46, and 663 of their runs scored totals fell within one standard deviation of their mean 943 runs (898 - 989). Predicting playing time is probably the most important part of making these simulations as realistic as possible. The projectors don't do it, so I try to use Diamond Mind to do it. So here's how the Yankees performed on average over those 1000 seasons, which led to their mean offensive output of 943 runs. That should give you an idea of how I allocated playing time. I tried to be somewhat realistic here, as opposed to penciling in the best 9 players for 162 games each. Let's compare that to the averages over just the seasons where the Yankees scored 1000 runs. Incidentally, the Yankees averaged 103 wins in those seasons. Here's where the differences showed up. There's no real magic formula there. They hit for a higher average, hit for more power, and drew more walks. The three players whose performance seemed to drive the offense the most in those seasons were unsurprisingly Bobby Abreu, Jason Giambi, and Alex Rodriguez. So, according to CHONE the Yankees do have a chance at doing it, but of course injuries will be the key. It'll be interesting to see what the other projection systems say. OK, since Blogger's not cooperating, we've set up a new temporary blog, at rlyw.blogspot.com. We're hoping to eventually have a new site up and running off Blogger completely, but for now this will be where our new posts will be located. Try not to be too intimidated by the fanciness of the new site. The comments section will work the same as it does on here. Randy Johnson is still a Yankee, although it would seem to be just a matter of time before that's no longer true. A lot of people seem to think that it's addition by subtraction to get rid of Johnson, but I need to reiterate again that I think it is going to hurt the Yankees in 2007, especially if the rumored package of a few minor league arms is what's coming back in return. There are plenty of reasons to be concerned about Johnson's effectiveness heading into 2007. He's going to be 43. He just had back surgery, and he's had knee problems for the last several years. 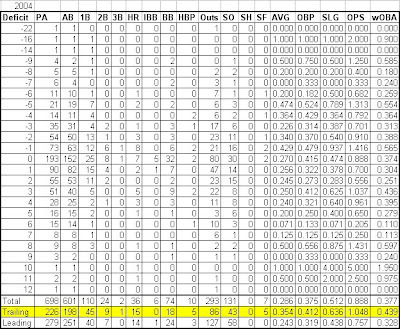 He also gave up a ton of runs last year, despite underlying peripherals that point to this being somewhat of a fluke. All that being said, all the projections I've seen for Johnson have him providing 180-200 innings of above average to good quality. Focusing on only his recent season and his ERA+ of 88 is not good player evaluation. To show why, I took a look at all the pitchers who've put up an ERA+ of 90 or worse in 200 innings or more since 1945. Here are the cumulative totals of all those players, Year 1 being the year they put up the ERA+ of worse than 90, and Year 2 being the following season. In this chart, ERA+ is the league average ERA adjusted for the players' home park, divided by the players' ERA, then multiplied by 100. 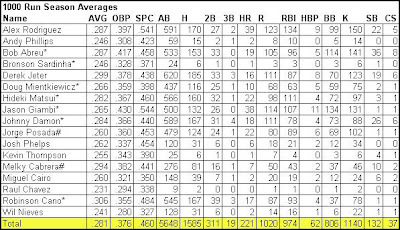 HR+ is the league average HR/Batters faced divided by the players' HR/Batters faced and multiplied by 100. BB+ is same thing, but for BB instead of HR. K+ is the pitchers' K/BF divided by the league average K/BF and multiplied by 100. As you can see, the biggest difference between the first and second year is the HR rate. Research has shown that HR rate is at least partly a function of fly balls allowed and has some fluctuation from year to year. BB rate and K rate are pretty constant, which indicates that at least part of the poor performance may have been on factors not in the pitchers' direct control. In the interest of full disclosure, the average age of these pitchers was 28 in Year 1 and 29 in Year 2, so they had relative youth on their side, something with Johnson doesn't have. As a group, these pitchers went from an ERA+ of 83 to an ERA+ of 95 the following season, and cut their runs allowed total by over 1/2 run per nine innings. So this group went from an ERA+ of 84 to an ERA+ of 100 (exactly league average), and cut their runs allowed by over 2/3 of a run per nine innings. The point here is that basing your player evaluation on one season of ERA is not smart. Single season ERA can have a lot of fluctuation, and is a poor predictor of future performance. Replacing Johnson with a combination of Jeff Karstens, Darrell Rasner, etc., is probably a 2-3 win downgrade. I re-ran my simulations from last week with them substituted for Johnson and the Yankees went from allowing 809 runs a season to 833. That's based on a pretty optimistic projection for Johnson, but it's still something that needs to considered. Now, if the Yankees do end up trading Johnson and saving a decent amount of money, it may still make sense, particularly if they can use the money or extra depth to shore up another are of weakness. Apparently a Roger Clemens return is one such option. I guess we'll just wait and see what happens, but it is imperative to me that the Yankees don't just give RJ away. Update: Darren asked me to look at players over the age of 37. Since I don't want to give Darren the satisfaction of doing precisely what he asked, I pulled the same data above but restricted the pool of pitchers to those above the age of 35 in their season of an ERA+ of less than 90. It seems that the bounceback effect is real, even for the older group. I would think that you would also have to adjust these sample sizes so they have the same innings pitched, because like you said the first time you did it, the truly bad players didn't pitch (or saw their innings significantly drop in relief) the following year. Jeteupthemiddle is of course correct, so here's the same group of pitchers, restricted to those who threw at least 162 innings in each of the two seasons, with their innings totals matched up to have the same weight in both samples. Once again, we see the bounceback in effect pretty clearly.